Just outside of Venice Italy, our Award-Winning design team creates our Forno Venetzia Wood Burning Ovens. Passion for Design..Passion for Food..Passion for Life. The Forno Venetzia Pronto combines the performance of a traditional Italian wood fired oven and the exceptional style and design Italy is famous for. Superior functionality and superb craftsmanship will quickly make the Forno Venetzia Pronto your preference when cooking for two or cooking for twenty! Regardless of the cuisine, the results will impress all of your family and friends. Ready to cook in 15 minutes. Maximum temperature of 800 degrees F. Commercial grade refractory brick hearth. Fully insulated dome and hearth ensures superior heat retention. 304 Grade stainless steel cart and shelves to withstand extreme environments. 430 Grade stainless steel oven to withstand extreme temperatures. More than just pizza! Bake, Roast, Grill ....or simply enjoy the fire! Folding prep shelf and retractable tool holder. 304 grade stainless steel cart and shelves to withstand extreme environments. 430 grade stainless steel oven to withstand extreme temperatures. Ready to cook in 15 minutes. Max Temp 800°F. Pronto 500 Outdoor Pizza Oven in Copper Just outside of Venice Italy, our Award-Winning design team creates our Forno Venetzia Wood Burning Ovens. Passion for Design..Passion for Food..Passion for Life. The Forno Venetzia Pronto combines the performance of a traditional Italian wood fired oven and the exceptional style and design Italy is famous for. Superior functionality and superb craftsmanship will quickly make the Forno Venetzia Pronto your preference when cooking for two or cooking for twenty! Regardless of the cuisine, the results will impress all of your family and friends. Ready to cook in 15 minutes. Maximum temperature of 800 degrees F. Commercial grade refractory brick hearth. Fully insulated dome and hearth ensures superior heat retention. 304 Grade stainless steel cart and shelves to withstand extreme environments. 430 Grade stainless steel oven to withstand extreme temperatures. More than just pizza! Bake, Roast, Grill ....or simply enjoy the fire! Pronto 500 Outdoor Pizza Oven in Copper is rated 5.0 out of 5 by 2. Rated 5 out of 5 by xyellowknifer from Great pizza oven Easy to assemble but does need two people at times. Quality is excellent and best of all, it works! Rated 5 out of 5 by Tom from Great product! It takes a while to heat the oven depending on your wood size. (Approx 1 hour for t... Great product! It takes a while to heat the oven depending on your wood size. (Approx 1 hour for the first time). Cooked the pizzas in about two minutes once heated. 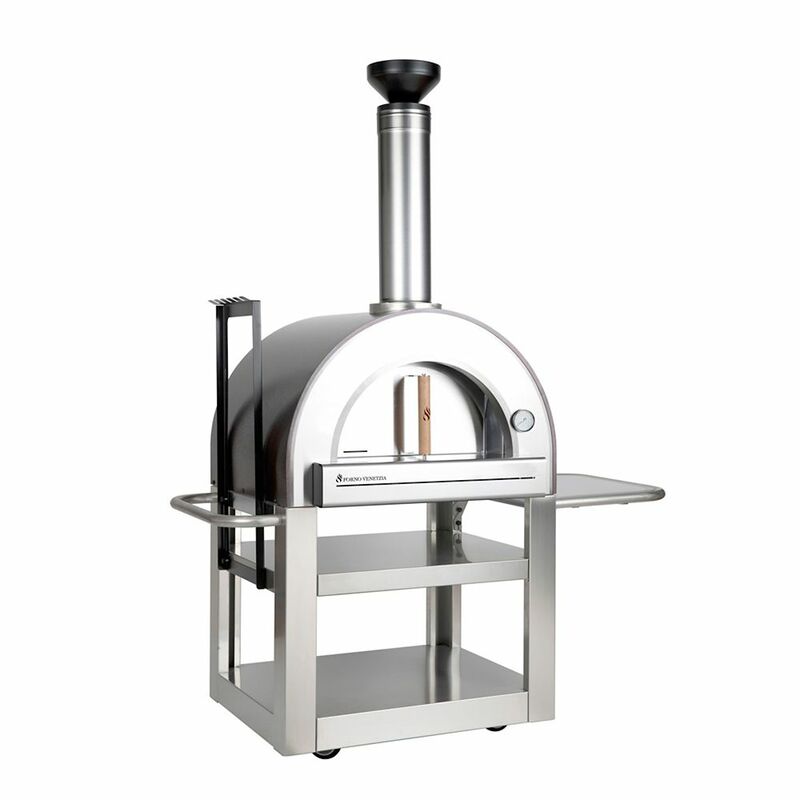 Very nice oven and at a lower than normal cost for a wood fired pizza oven.